Here you will find the multimeter which is especially suitet for your electrical magnitude measurment in different fields of electronics. Every multimeter possesses a large and clear display and fits easily in the palm of the hand which makes the multimeter very easy to handle. The multimteter is used, in professional training, in education, the industrial sector and in workshops. It is invaluable to professionals due to its high level of accuracy. 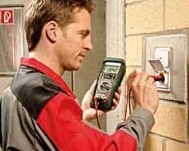 You will find a multimeter for every measuring task, be it low or high voltages. We offer devices that have manual or automatic range selection and with or without an RS-232 interface for transferring data to a computer for further analysis. The corresponding test cables for your multimeter come with the device as well as batteries so that it is ready to use straight out the box. Moreover, the multimeter can be accompanied by an ISO calibration certificate either when it is ordered or included as part of an annual recalibration. This allows them to be integrated into the group of internal testing tools of a company. Every Multimeter is equipped with a clear display and have a user-friendly screen. You will also find a multimeter with oscilloscope function or another multimeter that is launched as table-multimeter, in our portfolio. Either with the initial delivery or with the continuous (e.g. 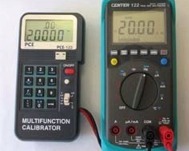 annual) recalibration, the multimeter is able to be equipped with an ISO certification. The multimeter is also able to be integrated into your internal ISO measuring instrument tool. As it has been said before these measuring instruments have many different options and functions. Some of them have the same functions like on oscilloscope others have similar functions like a clamp meter, which is used to measure voltage. They multifunctional tools that can be used in many fields of construction purposes but also in laboratories. If you can't find the multimeter you are looking for, please contact us and we will help you to find the best solution to suit your needs by calling our offices: +44 (0)2380 987030 our technical staff will advise you regarding our measuring instruments. Our engineers and technicians will be happy to help you with the multimeter, and of course, with the other products in the field of regulation and control, and scales and balances. Calibrating one of our multimeter. Testing the voltage with a multimeter. ETRAHIT Extra series multimeter. The easy mechanical construction and electrical components that are build in bulk production, are important advantages of these instruments. Therefore, these gadgets are very affordable. In addition to that, this multimeter is equipped with a protection circuit for overload and wrong polarity. Our instruments are nearly indestructible in the voltage measuring range. Collisions as well as crashes do not harm the multimeter, because there are no movable parts on the outside of the multimeter. Few measuring instruments show measuring options for frequencies, capacities, inductance as well as transistor and diode characteristics. By having sensors that measure sound, luminous intensity, humidity and temperature included, a few multimeters are not only designed for electrical values. With external sensors, which come with voltage outputs, the range of possible applications can be enlarged. Beside air humidity, sound, illumination or temperature measurements, the multimeter is able to measure further values of mechanical speed, pressure, air velocity and voltage, via a clamp. The Multimeter is available in several forms and types. The Pen multimeter or voltage meters with multimeter function are used by craftspeople which carry out small measurements. Handheld multimeters are mostly used in classical multimeter designs with a display in the upper part, the multifunctional rotary switch in the middle of the multimeter and a test cable in the lower part of the multimeter. 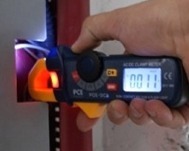 This type of multimeter is mostly used by maintenance professionals as a universal measuring instrument. The table or the laboratory multimeter are used in stationary workplaces. These multimeters usually have a larger display and are able to be provided with 230 V AC. Further categories of multimeters are measuring ampere callipers with multimeter functions or oscilloscopes with multimeter function. The measuring range on the multimeter will mostly be set automatically or by hand. If you wish to view or print a selection of our clamp meters from our catalogue, click the PDF symbol. in Polish in Serbian in Russian in Turkish and in Portuguese.